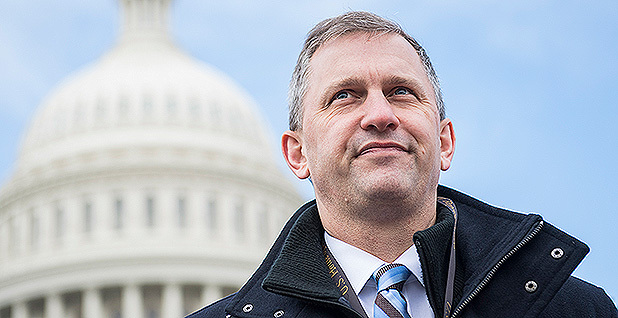 Freshman Rep. Sean Casten (D-Ill.) made climate change a rallying cry when he ran for Congress in the fall, but the former clean energy entrepreneur said Friday that he's skeptical of a new House committee formed specifically to address global warming. "I desperately, desperately want to be involved in making a positive difference on climate change right away. It is the most important challenge of our lifetime. It's existential," Casten said in an interview Friday off the House floor. But he added: "I have some concerns with the select committee." Much of his unease was directed at the ambitions of the newly created Select Committee on the Climate Crisis. Progressive activists and lawmakers, such as Rep. Alexandria Ocasio-Cortez (D-N.Y.), have urged Democratic leaders to use it as a platform to craft plans for a massive, climate-friendly jobs program they have dubbed the "Green New Deal." Casten said those goals, while well-intentioned, don't align with the political realities of a Washington in which Republicans still control the Senate and White House. "I don't want to spend two years talking about pie-in-the-sky things that would be great if we ever got the authority to do them," said Casten, who won his suburban Chicago seat by defeating six-term Rep. Peter Roskam (R-Ill.). "Would I love 100 percent renewable energy? You betcha. Would I love a world that has a lot of green jobs? You betcha," Casten added. But he said there are steps Congress could take in the interim. "You can't just start charging people off a cliff," he said. As an example, Casten talked about amending the Clean Air Act to encourage power plants to increase their efficiency — a proposal he floated during the 2018 campaign. Casten, who made a career of cutting carbon emissions by helping companies make use of wasted energy, also floated the possibility of finding ways to encourage the federal government to buy more clean energy. "Some of the barriers to lowering CO2 emissions are tax barriers," he said. "Some of the barriers to lowering CO2 emissions are actually in the Clean Air Act itself. Some of the barriers to lowering CO2 emissions have to do with the way that capital is allocated by the private sector." Notably, Casten said he would be more interested in serving on the Energy and Commerce Committee than on the Select Committee on the Climate Crisis. "It's where the expertise is," he said. For weeks, progressive activists in groups such as the Sunrise Movement have feuded with long-serving Democrats like Rep. Frank Pallone (D-N.J.) over the scope of the climate committee. Pallone, who is set to chair the Energy and Commerce Committee, has questioned the necessity of the new panel — an opinion that in turn prompted accusations that Pallone was protecting his own turf. The result, in true Washington style, was a compromise plan that few people like. While the new House Democratic majority is moving ahead with the climate committee, it won't have the power to move bills or issue subpoenas, and it won't focus exclusively on drafting plans for the "Green New Deal" (Climatewire, Jan. 2). Rep. Kathy Castor (D-Fla.), who will chair the select committee, said she's expecting the panel's roster to be filled out sometime in the next one to two weeks. An aide for Pelosi gave a similar timeline. "I hope we'll have a blend of passionate, knowledgeable freshmen and experienced members," Castor said Friday. On the Republican side, a few names have cropped up as potential ranking members. Reps. Francis Rooney of Florida and Jim Sensenbrenner of Wisconsin have both reached out to Republican leadership about it, though they would offer decidedly different perspectives. Rooney was the co-sponsor of a carbon tax bill last Congress, while Sensenbrenner is a longtime skeptic and former ranking member of the last Select Committee on Energy Independence and Global Warming. Castor said she doesn't know who will be ranking member and asked reporters last week whether they had heard any names. But, she said, "it would be better to have constructive members on the committee." Rep. Mike Levin (D-Calif.), an environmental attorney who ran on a platform of addressing climate change, said he has told Democratic leaders he would welcome a seat on the select committee. "I've already talked to Ed Markey about it," said Levin, referring to the Massachusetts senator who led the last select committee on global warming when Democrats controlled the House from 2007 to 2011. He said Markey told him he believed the panel was vital to building support for getting the House to pass the landmark Waxman-Markey carbon cap-and-trade bill on June 26, 2009. Even without legislative authority, Levin said, the select panel could play a lead role in outreach and building coalitions for passing any climate legislation that might emerge in the new Congress. Levin famously kicked off his House campaign by delivering a copy of "Climate Change for Beginners" to now-retired Republican Rep. Darrell Issa, whose seat he won.